A Continuity of Operations Plan can be referred to immediately preceding, during and following a time of an emergency. A written plan has been constructed as a framework or template for planning districts to follow. This provides a working model for operations, responsibilities, and tasks, and provides a plan of action, assessment, and organization. The template plan, as adopted by the planning districts, will help to mitigate the negative impacts of preparing, responding, and recovering from a wide variety of disasters. 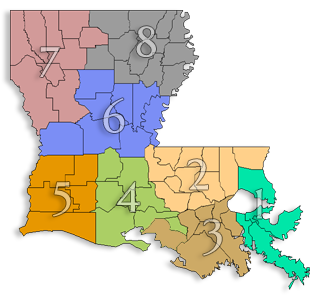 As part of the Louisiana Association of Planning & Development Districts’ planning for Continuity, we have established an internal content management system that will allow districts to community via its www.lapdd.org website from remote sites when evacuation has had to occur, so that we will be appropriately positioned to supply mutual aid. A Mutual Aid Agreement is being executed between all 8 planning districts within the state. The agreement provides an outline of action steps that can be taken by each planning district to render aid to other planning districts in time of need. It establishes lines of communication, a guide in disseminating responsibility, and promotes cooperation among the planning districts in time of an emergency. This Mutual Aid Agreement may be used by governing jurisdictions, agencies, and non-governmental organizations as a pattern to establish other functional agreements, as well. Each region of Louisiana has a Comprehensive Economic Development Strategy (CEDS). This planning “snapshot” provides direction and initiatives to be undertaken for job retention and growth; investments for community and economic development; and customized strategies relative to the dynamics of the individual regions. Often, the CEDS is referenced in individual communities’ applications for funding as a source of public awareness for investment needs. With this in mind, LAPDD has incorporated a overarching statement regarding the disaster experiences and resiliency components within the regions’ planning considerations. An examination of best practices provides a platform for us all to incorporate good ideas into our practices. Lessons are learned and ideas put into action for improved resiliency.